One of the latest nutritional discoveries that only recently began gaining good press and widespread awareness is something called resistant starch, or sometimes known as safe starch. This is a food quality, and it’s not relegated to one food - several different foods fall into this category. Resistant starch has been studied with increasing awareness of its ability to serve as a prebiotic, a fermentation fiber food source for friendly bacteria in the intestinal or gut flora. The results of an enhanced microbiome, in turn, lead to greater immunity to disease and improved overall health. Several different carbohydrate plant foods contain resistant starch. And some are enhanced with resistant starch by cooling after cooking. If it were not for the increased awareness of the microbiome’s friendly bacteria content and function over the past couple of decades, this resistant starch research information would probably still be under the radar of nutritional health awareness. This is Paul Fassa, the one who wrote this article. Thanks for trying to link the source of your correction, but I was blocked from access to that site. Don't know why really - seems like my computer or internet service considered it a dangerous site. So as yet, I can't say thanks for the correction. Do you have a safer source? I go by the sources that are available to me. I'm not a biochemist or biologist. If those sources miss the mark, so do I. I usually cross reference sources against other articles or studies. Maybe this time I didn't do enough.Then again, maybe there was a typo. Regarding the "omission", none of the sources I had used mentioned anything about FDA approval. The idea of this article was to point out how a starchy carbohydrate food could become helpful as a prebiotic. I don't think FDA approval or disapproval would matter to most HIN readers. It certainly doesn't matter to me. Thanks for a good article. However, there are two major mistakes - Resistant starch is insoluble fiber, not soluble fiber as you wrote. It is fermented like some soluble fibers but is really insoluble. Many researchers now refer to resistant starch as the third type of dietary fiber (in addition to soluble and insoluble). It is more valuable to move away from the limiting soluble and insoluble definitions (which are not meaningful in relation to their health effects) toward describing dietary fibers by their main mechanisms: bulking, viscosity and fermentation. Bulking fibers (like wheat bran and cellulose) hold a lot of water and physically provide bulking but are not fermented. Viscous fibers (beta-glucan and psyllium) lower glucose and cholesterol absorption because they thicken the chyme or contents of the intestinal tract. Fermenting fibers (resistant starch, inulin, beta-glucan) feed the intestinal bacteria and trigger specific health benefits. The second major omission is the fact that resistant starch has been approved by the US Food & Drug Administration for its benefit of improving insulin sensitivity and reducing the risk of type 2 diabetes. No other fiber can make this claim (approved as a qualified health claim in Dec of 2016). Resistant starch's fermentation changes the expression of >200 genes in the large intestine, some of which are directly connected to insulin sensitivity. Improved insulin sensitivity can be seen hours after someone eats resistant starch (without weight loss or exercise). This is a HUGE benefit, as 84 million American adults (34%) are prediabetic, (with similar rates around the world according to the International Diabetes Federation). This benefit should change the way we eat. Before processed foods, people routinely consumed 30-50 grams of resistant starch/day but now we're getting only 5 grams. The link to improved metabolism and improved insulin sensitivity should be a major part of your story, but was somehow left out. If you want to see the evidence, visit www.ResistantStarchResearch.com. I found your article interesting. Personally, I found that prebiotics improved my digestive function. 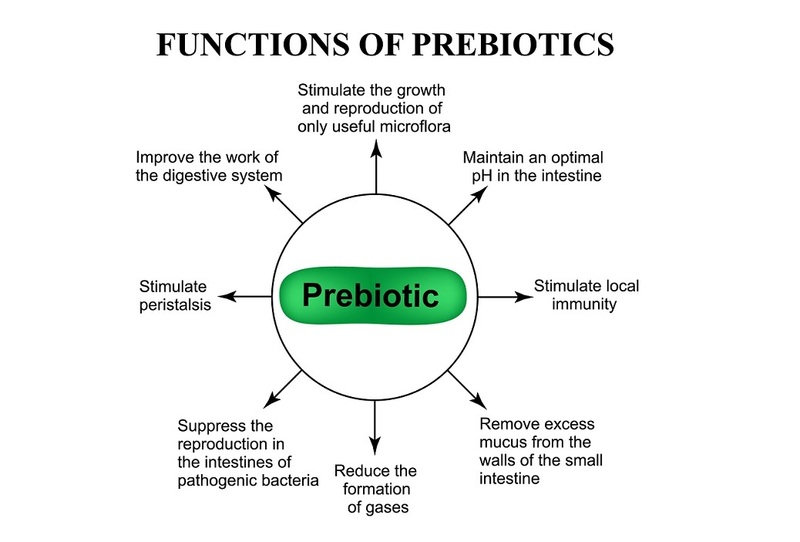 As a result I developed and launched Clue Prebiotic Water for simple consumption of daily prebiotics. It's a bottled water with 4 grams of fructooligosaccharides (FOS).